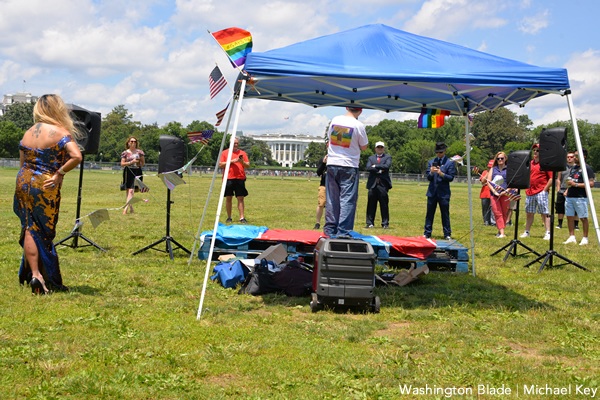 A total of just 18 people turned out on Saturday, June 1, for a Make America Great Again Free Speech Rally on the Ellipse section of the National Mall near the White House that was organized by Gays for Trump President Peter Boykin. Boykin and several others who spoke at the rally said they were certain that each of those attending the event represents thousands of others, both gay and straight, who are conservative, loyal Americans that deeply believe Donald Trump will provide the leadership needed to get the nation back on track. Boykin and others who helped organize the event promoted it as a nonpartisan rally for free speech but made it known that most of those expected to speak would be Trump supporters, although others would be welcome to speak. As it turned out, only Trump supporters spoke at the event. Ronald Reagan first coined the phrase Make America Great Again during his 1980 campaign for president, Boykin pointed out. He noted that Bill Clinton also used the Make American Great Again slogan in his 1992 presidential campaign. 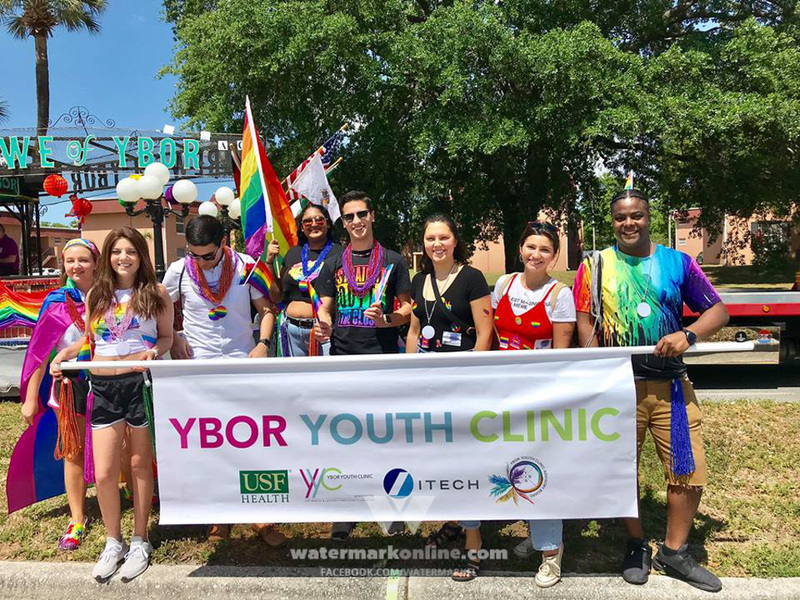 With temperatures soaring into the upper 90s, Boykin and some helpers set up a small stage with four loud speakers in front of a small tent decorated with American flags and two rainbow flags. With the White House and the national Christmas tree as a backdrop, the rally took place on a mostly empty Ellipse, which is large oval field with grass but no trees. Boykin and at least one other speaker gave several reasons for the small turnout. “It’s not that people didn’t want to come out,” Boykin said. “A lot of people said they would love to but they just couldn’t afford it. It’s the Fourth of July weekend and a lot of people also spend time with their families,” he said. Don Lime, who identified himself as a radio talk show host from Monterey Bay, Calif., who recently moved to D.C., said he believes the low turnout was due, in part, because conservative activists – he being among them – are pleased with the job Trump is doing as president. “I’ll shoot you straight. We don’t have a lot of people here. But I’ll tell you why,” he told the gathering from the stage. “It’s because when you’re ahead and when you’re winning you can stop everything. You just quit fighting because you’re winning every day. Every day has just been a win here, a win there, a win everywhere,” he said in referring to Trump’s accomplishments so far. Lime, who is black, said he has been criticized since moving to D.C. by the political establishment who he said sometimes can’t comprehend why a black person could support Trump. “I decided to become a conservative once I found out the truth that the media was tricking us and the Democrats had control for 30 to 40 years,” he said. “As a black person I realized I was being hoodwinked. What I mean is they thought that welfare is a good thing – absolutely not,” he said. Lisa Christiansen, whose resume describes her as a motivational speaker, writer, author, and creator of two charitable foundations, delivered a 50-minute keynote speech at the rally describing, among other things, how she came to believe Donald Trump would be and is becoming a highly successful president. She told of her upbringing and early childhood in Tahlequah, Okla., the capital of the Cherokee Nation, where she was born and where she did not learn to speak English until she was 10 years old. Years later, she told of her first meeting with Donald Trump in 2009 during a group visit to Trump Tower, the New York City residence and offices used by the Trump family before Donald Trump won election as president. She said she was “so impressed” with Trump as a businessman at the time of her meeting with him that when she learned six years later than he planned to run for president she immediately understood he would be best suited to lead the nation at that time. Others speaking at the rally included Los Angeles conservative activist and former Air Force officer Jack Cummins, who called it a “true blessing” that Trump has become president. Cummins criticized Democrats for calling on the U.S. to advance democracy throughout the world. 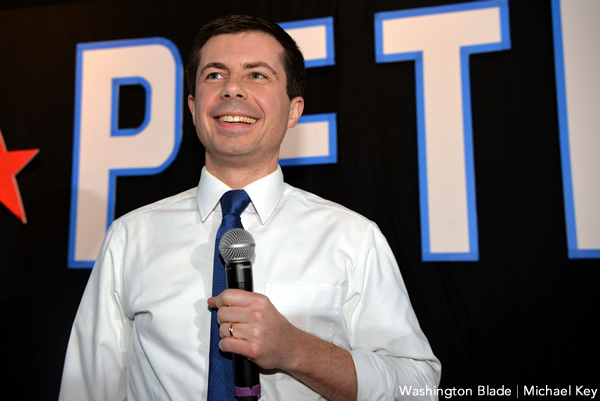 In concluding remarks as the rally drew to a close, Boykin – amid cheers from the attendees – said he was tired of being told that only Democrats support LGBT rights.